Posted on Mon, Mar 5, 2012 : 11:06 a.m.
With St. Patrick's Day on the horizon, Irish music is suddenly plentiful around the area. But the Detroit Irish Music Association is hosting a chance not only to listen, but also to learn. 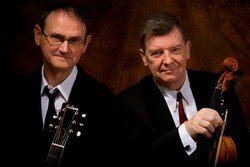 Both events feature two noted Irish musicians, fiddler Kevin Burke and composer/guitarist Cal Scott. First, at 7 p.m. Thursday, the two will offer workshops on fiddle and guitar. Material covered is suitable for all skill levels. The cost is $35 for an hour-and-a-half workshop; interested students should contact Colleen Gavin at colleen.e.gavin@gmail.com. Then, at 4 p.m. Sunday, March 11, the pair will perform in concert. Tickets are $16 in advance, or $18 at the door. Contact Gavin for more information. Both events take place at the First United Methodist Church Green Wood, 1001 Green Road in Ann Arbor. Burke’s fiddle playing has been at the forefront of traditional music for more than 30 years. His renown dates to the early 1970s (with such performers as Arlo Guthrie, Christy Moore and the Bothy Band and with his far-reaching solo album, “If the Cap Fits”). He has been a member of some of folk music’s foremost groups including Celtic Fiddle Festival and Patrick Street. Scott is a multi-instrumentalist whose professional credentials span a wide range of music, from traditional music to bluegrass to jazz and everything in between. He plays guitar, but also bass and brass. He plays and sings in the 8-piece folk ensemble The Trail Band. For more information about the performers, visit their websites at www.kevinburke.com and www.calscottmusic.com.